I've been loving the virtual runs in the blog world lately. I mean, I run every single day (well, in January anyway for the streak) so why not sign up for a virtual run with a chance to win some excellent prizes? Right? But then this virtual run came to my attention. A little history, Heather, has three beautiful girls. 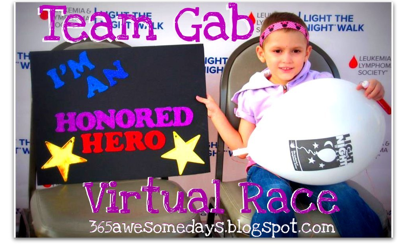 Her youngest, 5 year old Gabby, was diagnosed with Acute Lymphoblastic Leukemia last January. Heather has organized an incredible virtual run where you choose your running distance and donate to the Pediatric Cancer Research Foundation. I am completely 100% on board with this one because I hate cancer with a passion. Heather, you are one incredible mom. I hope you raise lots of $$ for the Pediatric Cancer Research Foundation! This is one that I am so glad I signed up for. What a wonderful cause!